How do we know God has really spoken to us? How do we know it wasn’t just our imagination, but that it was really Him? I recently told the story of hearing the words “Forgive you” from God, and in the comments section someone asked how I knew that message was from God. She said that she had thought she’d heard from God in the past, but then it turned out not to be from God — a very painful experience for her. My heart hurt so badly as I read her comment. And it’s such an important question that I wanted to devote an entire blog post to unpacking the answer. Before answering the question, however, I want to clarify what I’m not talking about: I’m not talking about making decisions. Different people have different ways of interpreting circumstances for decision making, and it’s far too easy to seek God about a decision, think you’ve heard from Him, and then doubt it when trials come. When things go wrong, it’s easy to look back and think you didn’t hear from God right. Situations may turn tricky and uncomfortable entirely apart from your actions. They might get complicated because of miscommunication or even someone else’s actions or sins. So that’s not what I’m talking about here. I also don’t think it’s wise to look back and think, “Oh, I heard from God wrong” or “I misinterpreted Him.” It only brings pain, and who’s to say it was wrong anyway? We don’t know the purposes He has for us in each season of life. So I guess I just approach decision-making with the trust that even if I make the “wrong” decision, He is there to pick up the pieces and guide me along further. I think it helps if we are not fatalistic in this regard. 1.) Unexpectedness. God often gets my attention with an answer I couldn’t have come up with on my own, in that time and place. In this recent story, I was in really low place. I was thinking God had given up on me because I had given up on myself, and so the unexpected nature of the answer told me it was from Him and not my own mind. Another time God’s voice surprised me was when He told me to believe He loves me. I was in a place of unbelief when the clear message that came to me was “Believe.” So when an answer catches me off guard like that, it feels like it’s from Him rather than from my own imagination. 2. Scripture. Does the message I just received line up with the truth of the Bible? If it does, I know it’s God, and that I just needed a bigger, more intimate, experience of Him to really receive the truth emotionally instead of simply reading the text intellectually. In this case, the truth of Jesus’ constant forgiveness of us as we are walking with Him is backed up by Scripture (I John 1:7), so I know I can believe it. Another time His message was about following Jesus alone and not being distracted by other things. When these truths are in the Bible, I trust these experiences to be from God, because they are verified in His Word. 3. Fruit. Does this truth bring me lasting peace or joy or love? If it does, if it quiets my spirit and brings me closer to God, then I trust it is from Him. I believe Jesus’ sacrifice is for all time, for all my sins. So in this most recent case, it’s not that I have to earn His forgiveness by asking for it each time I sin. Rather, repentance is for us. It brings us back to God, back to the truth of His holiness and sacrifice for us. Repentance is for us to feel the forgiveness that is already accomplished. And so when that conversation with God helped me to continue walking in forgiveness of myself and others, and my anger dissipated, then I knew it was from Him, because kindness and forgiveness are His will for us (again going back to Scripture in that). The other time I mentioned, when God told me to believe He loves me as much as He loves my husband, I was able to start walking in peace. I didn’t have to strive for anyone to pay attention to me anymore, because I knew viscerally — and not just cerebrally — that God loves me. I didn’t fight with my husband over those things anymore, and I continue walking in that internal and external peace to this day. That, to me, is the fruit of the Spirit at work in my life and marriage, and so I trust the message was truly from Him, because I began to walk in freedom, a freedom that was long-lasting. I’m not sure if the times my recent commenter was talking about were these kinds of things, or whether they were decisions that had to be made (which, as I said, are much more difficult to judge). I do want to acknowledge the fear of hearing “wrong” and the fear that God won’t speak to us at all. I’ve had those fears too, and they’ve caused me to avoid speaking to God about my problems. It’s scary to ask Him to talk to us and feel like we’re not getting an answer. I want to close in a prayer for all of us, in whatever situation or struggle we are currently seeking God. I pray that we will hear from Him, that we will know we’ve heard from Him, and that His voice will bring the much-desired peace, joy, and love in our lives. Excellent! 🙂 I especially like that you highlighted Scripture and Frutifulness. Especially in these times, it’s so important to make sure what we are doing is scripturally based. Thanks for the list. 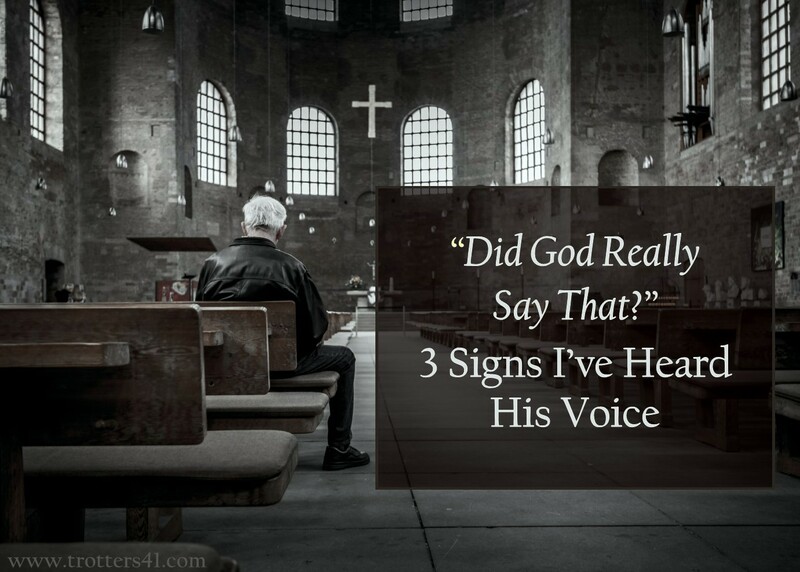 I’ve become more sensitive to hearing God’s voice over the last 5 or so years, but I never want to start believing that my overactive imagination is His voice or something like that. I’ve definitely heard other people say that God told them some things that don’t line up with scripture, so I know that’s a good guideline. Well said….i have the same thoughts. Hearing HIS Voice is paramount in fulfilling HIS destiny for us. I cannot tell you the number of timed HIS word has confirmed direction in my life even though at timed it did not make sense. As I have learned to trust HIM completely I have come to a place of rest, assured that HIS will will be done . To trust the LORD is to know HIM. Let us abide in HIM….safest place this side of heaven. HIS word is HIS will for us. Therefore, let us spend time daily in the word for in HIS presence id fullness of JOY! Speak LORD your servants are listening. Thank you for sharing your stories Bonnie! I love how God speaks to you through songs and scriptures. I am also very sensitive to songs and so thankful for all the ways God speaks to me, including through words from the pulpit. I should really stop being surprised by now, but I keep on being surprised by God! “Speak Lord, your servants are listening.” Love it. Agreeing with you in that prayer, for today and always. I’m always so blown away by the kindness of the LORD when he speaks to me. I’ve had just a few occasions like you share, and each time, the LORD’s voice was so gentle and kind, even when if was a rebuke. That is what was so unexpected, and so real.